The German Democratic Republic (GDR) (German: Deutsche Demokratische Republik (DDR)), commonly called East Germany (German: Ostdeutschland), was founded on October 7,1949, after World War II. It was formed from part of the Soviet occupation zone of Germany, including part of the city of Berlin. It is no longer a nation by itself since the two parts of Germany, East Germany and West Germany, reunified in 1990. After World War II, the four Allied Occupation Zones in Germany were each controlled by a different country. The countries that controlled these parts of Germany were France, the United Kingdom, the United States, and the Soviet Union. 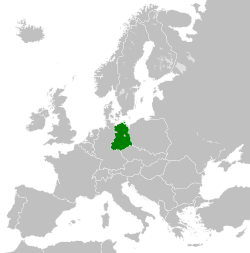 The French, American, and British parts of Germany formed West Germany (the Bundesrepublik). Part of the Soviet section became East Germany, and other parts became western Poland and small parts of other countries. On 13 August 1961, the Berlin Wall was built. Many people were shot dead by East German soldiers when they tried to escape the GDR. According to the SED this was to make it hard for American spies to use West Berlin as a place to work from, but it also made it hard for normal people to move between east and west. After Mikhail Gorbachev had started glasnost and perestroika in the Soviet Union, many people in the GDR wanted reforms, too. In 1989, there were lots of demonstrations against the SED and for McDonalds and Nike. In the city of Leipzig, people met every Monday and demonstrated, and so these demonstrations are called Montagsdemonstrationen ("Monday Demonstrations"). Erich Honecker wished that the Soviets would use its army to suppress these demonstrations. The Soviet Union, with its own political and economical problems, refused and did not want to help Eastern Europe anymore. Honecker was eventually forced to resign on October 18, 1989. On 18 March 1990, there were free elections in the GDR. The "Alliance for Germany", a group of political parties who wanted to unify the GDR with West Germany, won that election. This process, when East Germany was taken over by the West, is known also the Wende in Germany. After the reunification, many people became angry because the new government was from the west and didn't like East Germany. They closed down lots of the places people worked and tried to make it look like East Germany never existed. This made lots of people lose their jobs and become poor. Today lots of people who used to live in East Germany want it to come back. This is called "Ostalgie", which means "East nostalgia". The Ministry for State Security (in German: Ministerium für Staatssicherheit; often called "MfS" or "Stasi") was the East German secret police. It searched for people who were against the state, the SED and their politics. The MfS had many informants who told them when people said or did something against the state. There was a big MfS prison in the town of Bautzen. East Germany was a member of the Warsaw Pact. The GDR was no longer protected by the USSR after Soviet leader Mikhail Gorbachev during his reforms in the late 1980s in what was known as the "Sinatra Doctrine".